Martin O’Neill and the FAI parted ways by mutual consent on Wednesday, bringing to an end the Irishman’s five-year tenure as Republic boss. Here we analyse the stats that suggest O’Neill had to go. “The great managers, who might be considered dinosaurs now, they had a philosophy about how they wanted the game to be played. But, the key thing is regardless of the players they had at their disposal, they had to try and get the very best out of them. “If you are trying to compete and win against teams who might look stronger on paper, you are at a disadvantage, you have to try and make up for those disadvantages in any way you can. – Martin O’Neill, Aston Villa manager (August 2006). That last sentence is important, “you set up your team to win”. 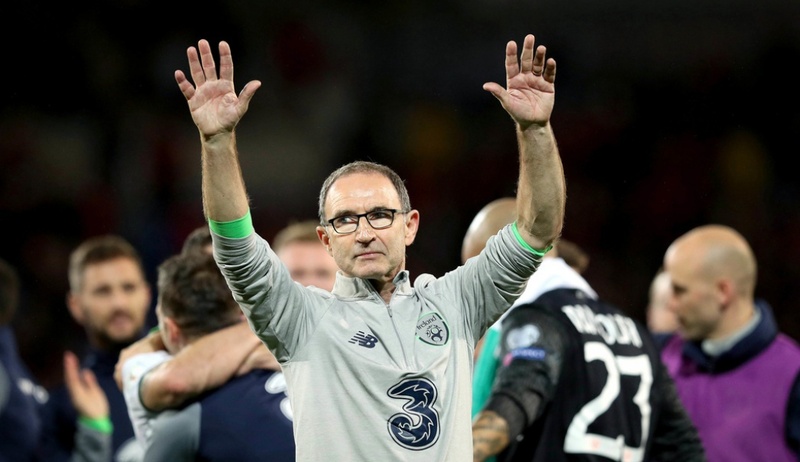 After fifty-five games with Martin O’Neill at the helm, the same cannot be said of the tactics employed by the Republic of Ireland boss, whose five-year reign came to an end on Wednesday. Monday’s forgettable stalemate with Denmark was the last straw for many, with O’Neill opting to name seven defenders in his side. Endearing himself to Irish fans, or anyone with a pair of eyes for that matter, he certainly was not. Prior to writing this analysis piece, I had refused to call for Martin O’Neill to be relieved of his duties. Not yet, I told myself. I needed to see the facts. It was important to investigate further into the perceived regression under Martin O’Neill prior to calling for his head. Most rainy Wednesdays in winter are bad, but rainy Wednesdays in winter spent reviewing every single Irish performance under Martin O’Neill are worse. I began my analysis with a strong cup of coffee in one of the eco-friendly cups. I’d certainly need all the help I could get as I journeyed back in time to some of the most excruciating performances in recent memory. Some results I had completely forgotten, no doubt memories my brain felt important to repress. Lacking creativity, soft, collapsing at the slightest application of pressure. Those eco-cups were just no good. Martin O’Neill was announced as Republic of Ireland manager in November 2013, a month in which the Republic would face Latvia (H) and Poland (A). These were the only two international fixtures under O’Neill’s reign in 2013, and as a result, can distort the facts in the Republic of Ireland manager’s favour. However, the success of these first two games also means there is a deeper drop associated with the decline that inevitably occurs from 2014 on. 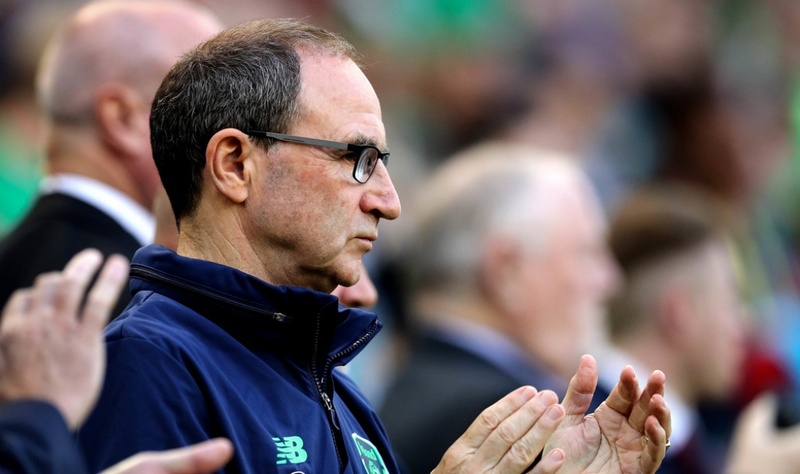 Overall, Martin O’Neill was in charge for fifty-five games, winning nineteen of them and losing sixteen. Draws, of which there are twenty, were a staple of the O’Neill era. As can be seen, we were particularly resolute in 2015, with four wins, four draws and just a solitary loss. 2015 included draws with England, Scotland, and a successful playoff win over Bosnia. Unfortunately, this would be the peak for our defensive talents, and by 2018, the win and loss column would swap places to leave us with just one victory in nine games. 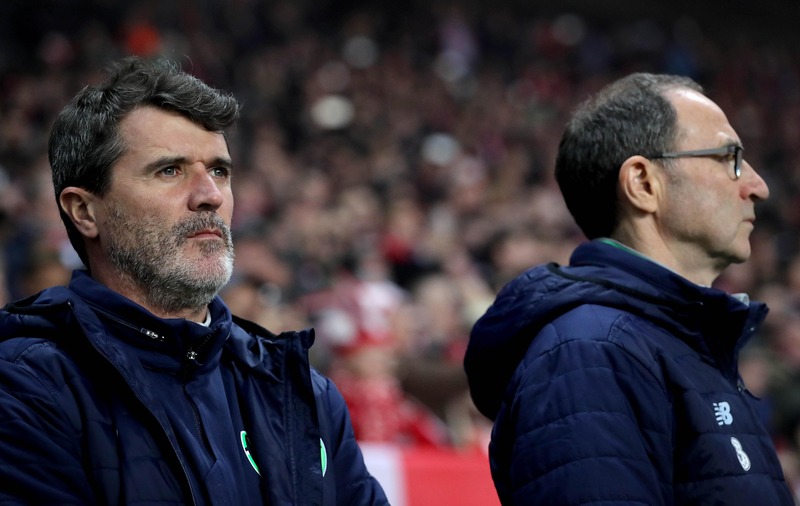 The contrast between 2015 and 2018 is highly alarming, as it marks a period of stark decline in Ireland’s footballing style, despite the heroics of Euro 2016 the following summer. 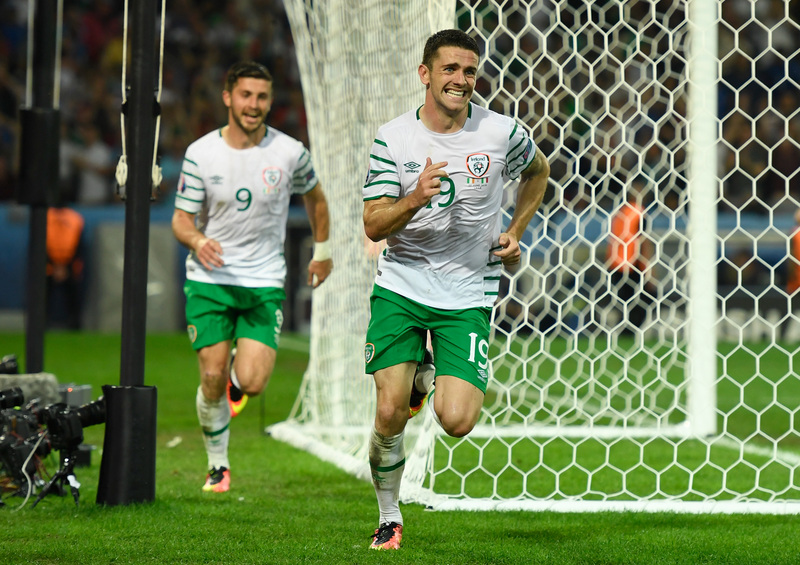 The victory over Germany, which will forever be remembered as one of the great moments in Irish football, papered over many cracks that were evident on that famous night in October 2015. After drawing the reverse fixture in Gelsenkirchen a year prior, and recording just 35% possession, many hoped Ireland, needing a big result, would take it to the Germans. 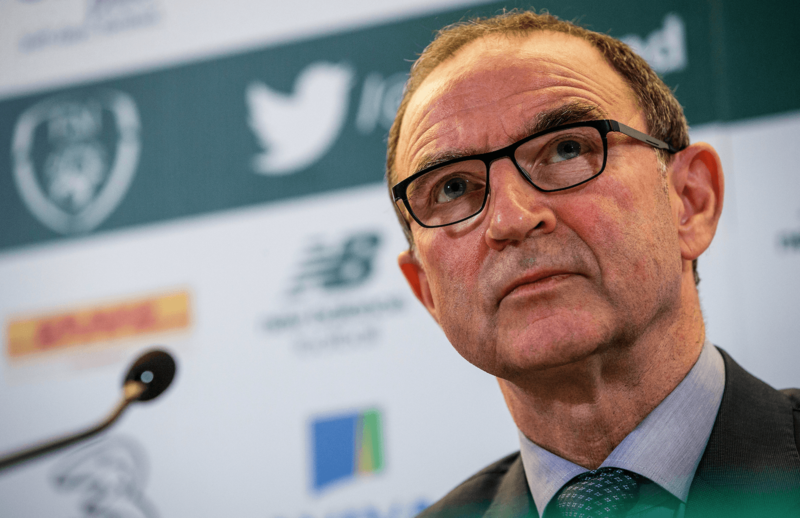 However, as would become customary to Martin O’Neill’s teams, he packed the defence, leading to just 28% possession at home and Germany registering sixteen shots. But of course, none of that mattered because ‘Shane Long was on fire’. Conclusion: We were winning less games, and losing more games, than ever before. While football has become far more complex than simply equating possession to a good performance, the age-old adage that the opposition can’t score when you have the ball cannot be argued. Additionally, when the scales are tipped so far in one team’s direction, it clearly points to a dominant force. That aforementioned 28% possession stat against the Germans was alarming but supporters would argue that it was a necessary, well-executed tactic from O’Neill. 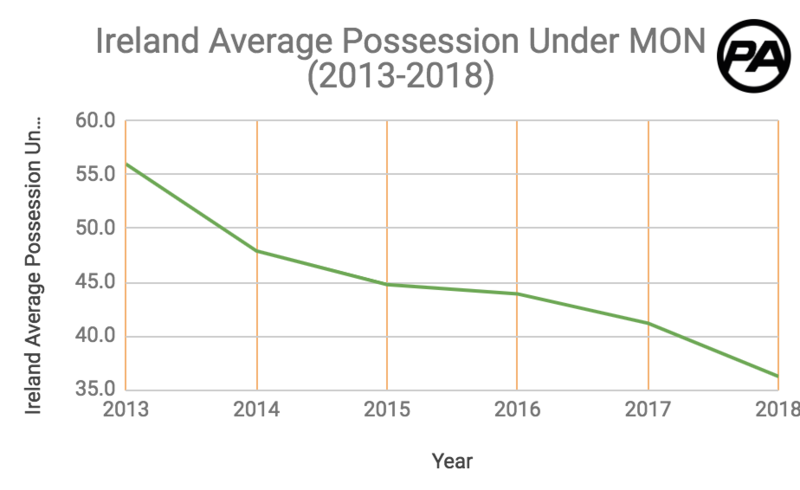 Unfortunately, the possession stats for Ireland from 2013-2018 paint a picture of sharp decline. 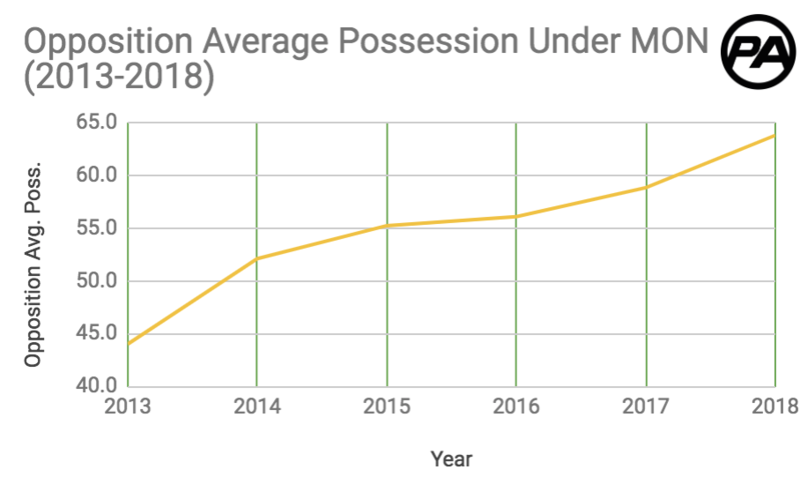 Our average possession per game dropped considerably from 47.9% (2013) to 44.8% (2015) and continued to drop all the way to 36.2% in 2018. We had less ball, our opponents had more ball, and it got worse with every campaign. 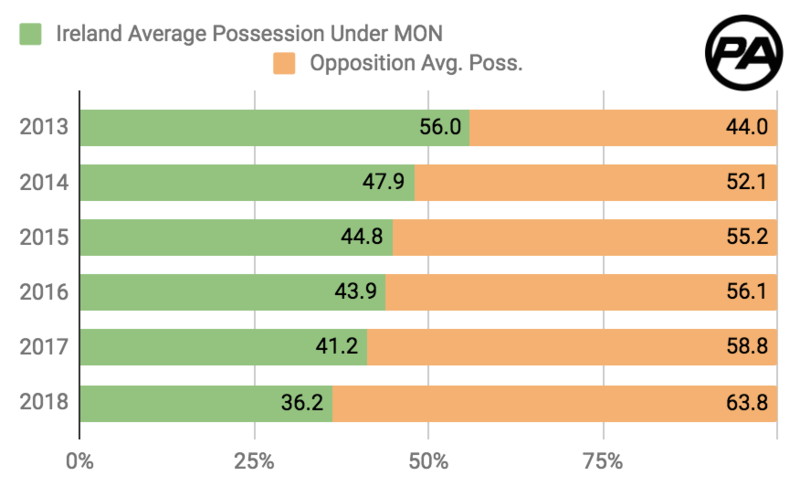 In 2014, Ireland’s opponents maintained a ‘paltry’ 52% of possession, a far cry from the massive 64% opponents now average. That’s an increase of 23% more possession or twelve percentage points. 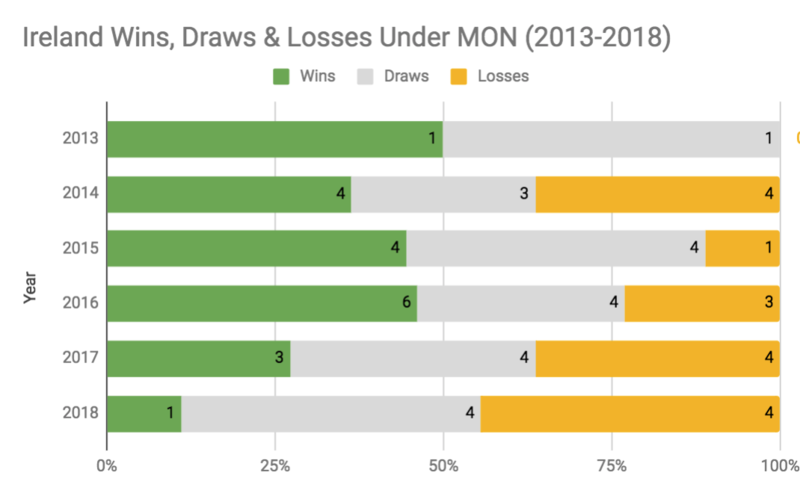 Relegation from the Nations League means Ireland’s seeding in future competitions has been negatively impacted, resulting in a likelihood of facing a stronger calibre of opposition in future campaigns. We are now in Pot 3, along with footballing powerhouses Israel, Scotland, and Norway. This would suggest that the worrying decline in possession was set to continue under Martin O’Neill’s watch, and hence why his tenure has come to an end. Conclusion: We were holding considerably less of the ball, while our opponents were receiving considerably more, growing from 44% to 69% on average. 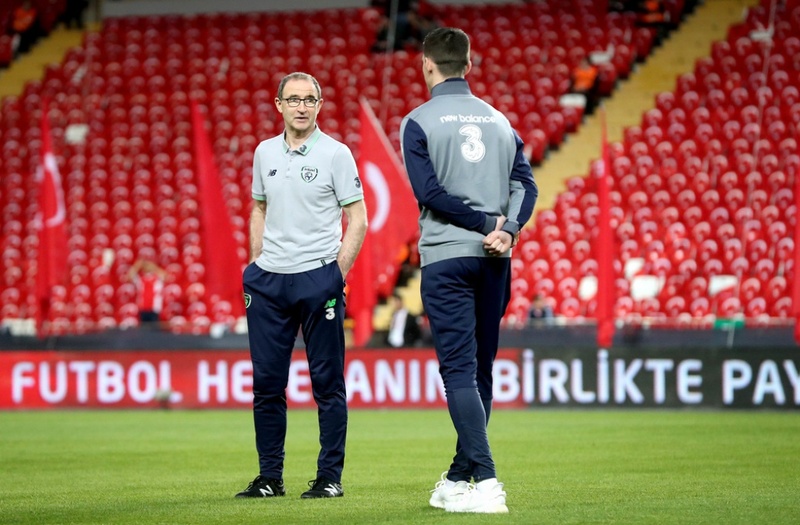 Despite conceding just one goal in the last four games, including three clean sheets, Martin O’Neill’s defence was still under serious pressure. Against Denmark on Monday, O’Neill named a side with seven defenders (inc. Robbie Brady) plus a goalkeeper. This negative outlook paid off on the scoresheet, but in truth, Ireland were extremely lucky to come away from Aarhus without conceding. Denmark registered fifteen shots at home, three on target, and but for the post, would have scored. The final whistle blew to put all out of their misery and O’Neill’s side escaped Denmark with a point as quickly as you can say “I’m-hopeful-about-Declan-Rice“. O’Neill’s defensive tactics, in essence, were like throwing one-ply tissues on a gunshot wound. The wound continued to worsen, but his solution was to use more pieces of tissue, attempting to delay an inevitably fatal outcome. Maybe people would have stopped shooting had O’Neill decided to use some of the weapons at his disposal warming the bench. 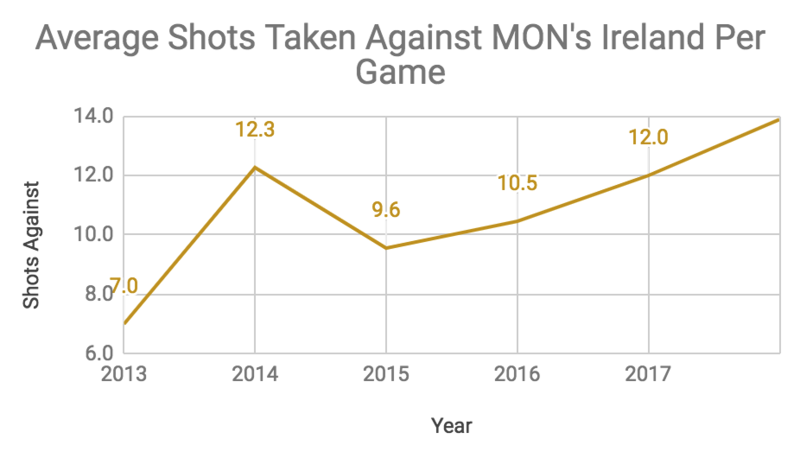 The average number of shots being taken against Ireland ballooned from seven to fourteen in 2018. A 100% increase, despite us playing a significantly defensive-led style of football. Conclusion: On average, shots on target from our opponents doubled from seven to fourteen despite packing the defence and midfield with defenders. 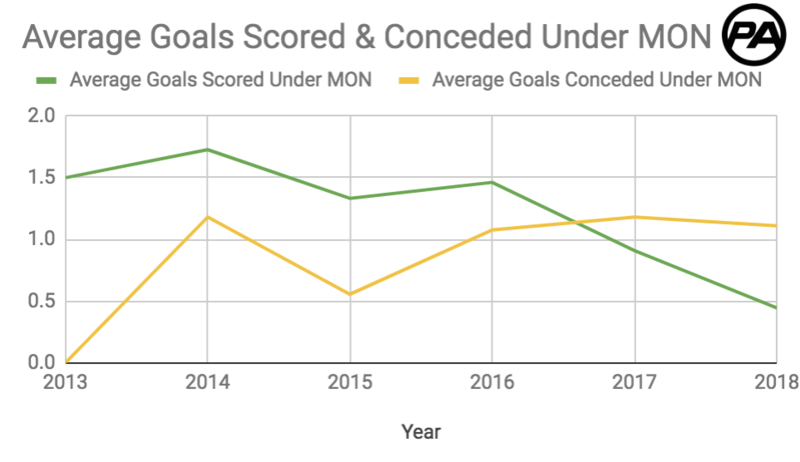 While goals conceded on average have traded places from 1.2 (2014) to 0.6 (2015), and back to 1.2 (2017), Ireland’s performances at the other end of the pitch have been less than fortuitous. The current Ireland attack is about as enchanting as a drunken John Delaney singing rebel songs and the evidence lies in the number of shots taken by O’Neill’s side. From a high point of averaging 1.7 goals per game in 2015, our attacking potency has plummeted to averaging just 0.4 goals in 2018. To further underline this depressing dearth of goalscoring prowess, we have now failed to score in four straight games for the first time since 1996. We have also only registered more than one goal on one occasion in 2018; a ‘barnstorming’ 2-1 performance against the USMNT United States. When the former Celtic manager took the reins back in 2013, Ireland were averaging eleven shots per game. 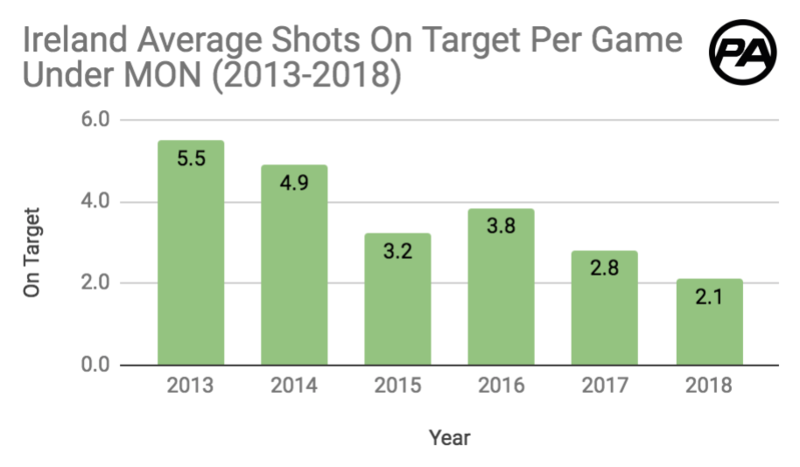 Fast forward to 2018, and we are now averaging just nine shots per game, a drop of 18%. While this may not alarm Irish fans too much, the number of shots on target per game should. From a high point of 5.5 shots on target per game in 2013, Ireland’s efficiency has plummeted to a low point of 2.1. Let’s look at that again; Ireland under Martin O’Neill in 2018 averaged just two shots on target per game, despite opponents of the calibre of Northern Ireland, Wales and the USA. And what was the manager’s antidote to this venomous footballing poison? Sure let’s throw more defenders on. O’Neill’s approach to what was a very clear problem stank of a fear of failure. He set teams up not to concede, and to bore oppositions into submission. Such tactics may have been successful for Homer Simpson’s boxing career, but unfortunately, there was no Moe Szyslak ready to drop from the skies to rescue O’Neill. Something needed to change, the manager’s defensive approach was not working. Conclusion: Ireland’s average shots on target per game dropped from six (rounded up) to two, a reduction of 66%. Martin O’Neill gave us some fantastic memories as Ireland manager, and for that, I am forever grateful. That moment in Lille will never be forgotten. However, his lack of creativity, outdated footballing tactics, and stubborn attitude means Irish football heading into 2019 will be in better hands without O’Neill, than with him. Thanks for everything, Martin, but it’s time for a fresh approach, and one that believes in our players.